← An interview with me! I’m posting this at the request of the wonderful Philip Giffin, to mark my article appearing in the Palisadian Post. Angela Logan can. When she was about to lose her house, baking was what she turned to – that and the community she had built over a lifetime of good deeds. Her apple cakes not only saved her home but inspired “Apple Mortgage Cake,” anupcoming movie on the UP network. Despite not knowing pinches from pounds, Giffin, the film’s Emmy-nominated composer, was tasked with creating music for Logan’s apple cakes. For him, telling her story through music became his own kind of baking, and a reflection on a life lived through shared values of kindness and community. Music has been a part of Giffin’s life for as long as he can remember. Growing up in Wooster, Ohio, his first inspiration was his father, who is still an avid music fan at 88 years old. For the past 20 years they’ve made an annual pilgrimage to New Orleans for the French Quarter Festival, where they wander from stage to stage, taking in the food, jazz and culture of The Big Easy. 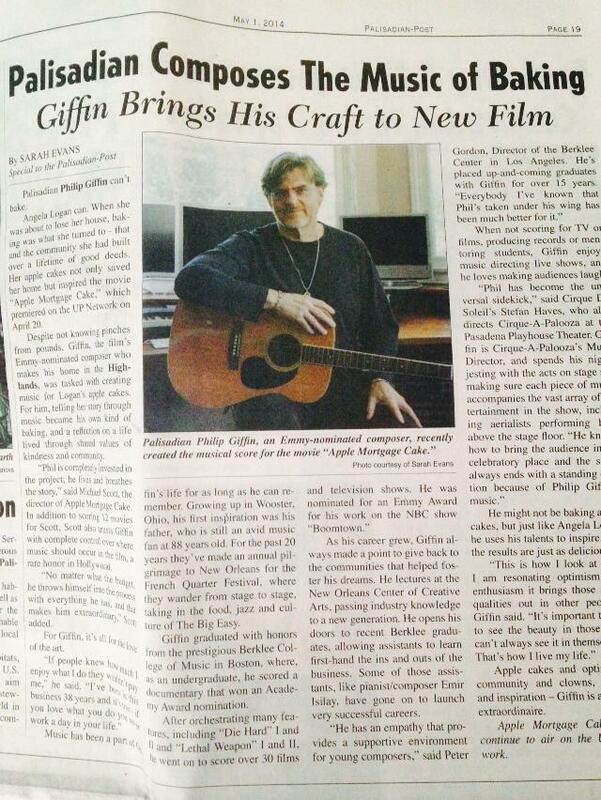 Giffin graduated with honors from the prestigious Berklee College of Music in Boston, where, as an undergraduate, he scored a documentary that won an Academy Award nomination. After orchestrating many features, including Die Hard I and II and Lethal Weapon I and II, he went on to score over 30 films and television shows. He was nominated for an Emmy Award for his work on the NBC show Boomtown. As his career grew, Giffin always made a point to give back to the communities that helped foster his dreams. He lectures at the New Orleans Center of Creative Arts, passing industry knowledge to a new generation. He opens his doors to recent Berklee graduates, allowing assistants to learn first-hand the ins and outs of the business. Some of those assistants, like pianist/composer Emir Isilay, have gone on to launch very successful careers. When not scoring for TV or films, producing records or mentoring students, Giffin enjoys music directing live shows, and he loves making audiences laugh. He might not be baking apple cakes, but just like Angela Logan he uses his talents to inspire, and the results are just as delicious. Apple cakes and optimism, community and clowns, music and inspiration – Philip Giffin is a baker extraordinaire. This entry was tagged article, freelance, writing. Bookmark the permalink.